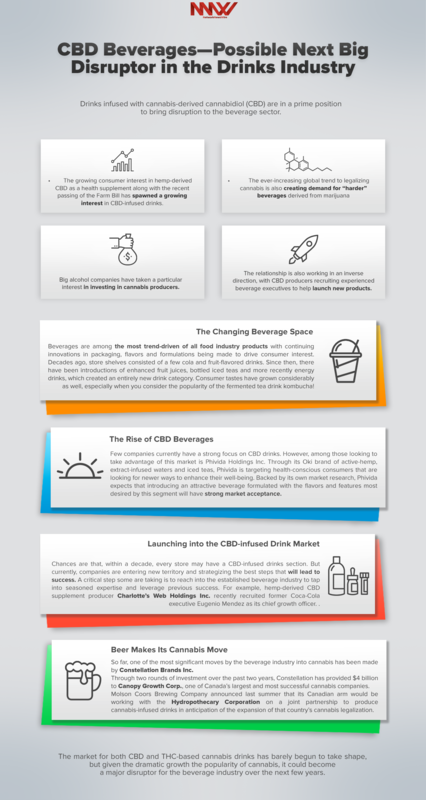 Corporate interest in building a cannabis-infused beverage profile demonstrates the level of potential growth for such an industry, with key developments being made across multiple channels. To address the needs of the wellness-oriented consumer, Phivida Holdings Inc. (CSE: VIDA) (OTCQX: PHVAF) (PHVAF Profile) has created a line of active hemp extract (CBD)-infused drinks that are just starting to hit store shelves and is expected to be distributed to a thousand retail outlets in Q2. In the adult beverage sector, Constellation Brands Inc. (NYSE: STZ) has made a $4 billion investment in Canopy Growth Corp. (NYSE: CGC) (TSX: WEED), fueling research into cannabis drinks which suggests a proactive approach to addressing the potential sales impact in markets where consumer use of marijuana is legal. The Canadian business unit of Molson Coors Brewing Company (NYSE: TAP) has also made a deal with a cannabis producer to create beverages for that market. In the health supplements sector, Charlotte’s Web Holdings Inc. (OTCQX: CWBHF) (CSE: CWEB), which markets hemp-derived CBD oil, has recruited a former Coca-Cola executive to bring beverage sector expertise into the company. Driving the growth of this new segment is the rocketing popularity of CBD as a health supplement. One of the many active ingredients in cannabis, CBD doesn’t produce a high in users, unlike cannabis’ more famous constituent, THC. While research into CBD is in its early stages, consumers are increasingly looking for products containing CBD to address a variety of health issues such as anxiety, pain, and immune health. This has been aided by the passing of the Farm Bill in December 2018 which legalized hemp — defined as a variety of the cannabis plant that contains less than 0.3 percent THC — and allows its production and sale in all 50 states. For companies such as Phivida, which process the hemp plant into their products, this has provided them with a significantly large market to grow into. A critical step some are taking is to reach into the established beverage industry to tap into seasoned expertise and leverage previous success. For example, hemp-derived CBD supplement producer Charlotte’s Web Holdings Inc. (OTCQX: CWBHF) (CSE: CWEB) recently recruited former Coca-Cola executive Eugenio Mendez as its chief growth officer. The company has stated its strategy is to expand into new segments, and Mendez could provide vital experience for a move into beverages. Another key step is designing a beverage that will have the most consumer appeal. To align with the sentiments of their target consumers, Phivida’s Oki brand flavored waters and iced teas contain non-GMO, natural and organic ingredients; are plant based and vegan friendly; and are packaged in sleek 100 percent recyclable glass containers. The flavor line-up, which includes Watermelon Relax and Lemon Ginger Harmony, are aligned with the current preferences of the health-conscious consumer. Phivida’s surveys have resulted in product testing scores as high as 80 percent from its sample group of 1,200 individuals for its OKI beverage. The new leadership team has also put in significant effort to ensure that Oki has the distribution channels necessary to reach consumers. Company officials have been working with one of the nation’s largest grocery distributors and meeting with both national and regional chains to secure retail contracts. Several retail contracts are in development, and Phivida expects Oki to be available in more than 1,000 outlets by the second quarter of this year. So far, one of the most significant moves by the beverage industry into cannabis has been made by Constellation Brands Inc. (NYSE: STZ). The company behind brands such as Corona beer and Svedka vodka has taken an active interest in the cannabis sector. Through two rounds of investment over the past two years, Constellation has provided $4 billion to Canopy Growth Corp. (NYSE: CGC) (TSX: WEED), one of Canada’s largest and most successful cannabis companies. This investment provides Constellation with one-third ownership of Canopy Growth and the potential to take that investment further. In another team-up between a brewer and a Canadian cannabis company, Molson Coors Brewing Company (NYSE: TAP) announced last summer that its Canadian arm would be working with the Hydropothecary Corporation on a joint partnership to produce cannabis-infused drinks in anticipation of the expansion of that country’s cannabis legalization. Cannabis beverages and edibles are expected to be made available by October 2019, and Molson will be positioned to serve that new sector once it is made legal.